The concept of food addiction is gaining increased support from scientists and medical professionals as a real issue that impacts many. However, in the general population, food addiction remains relatively unknown. According to studies conducted using the Yale Food Addiction Scale (YFAS), the only tool currently used to assess the prevalence and symptoms of food addictions, food addiction rates in the United States vary between 5% and 10%.1 Most studies also suggest that food addiction is more common among women (12.2%) than men (6.4%) and among those who are obese or overweight. In addition, some studies suggest that food addiction is more common in individuals age 35 and older, but that rate begins to drop for those older than 65.2 Food addiction can also contribute to a higher likelihood of developing diabetes and other health issues over time. Loss of control: You experience the inability to control cravings, despite efforts or desires to control overeating or to eat healthier. Unsuccessful attempts to quit undesired behavior: Similar to drug addiction or gambling, you are unable to stop overeating, despite numerous efforts or desires to do so. Avoiding other activities to fulfill cravings: You may avoid social situations or isolate yourself for fear of others’ perceptions of your food intake. Tolerance: You eat more and more, while the food satisfies you less and less, so you need more food to achieve the desired effect. Withdrawal symptoms: If you are unable to obtain a certain type of food, you may develop feelings of withdrawal until you get that food. How Is a Food Addiction Different from an Eating Disorder? While both may have similar symptoms and causes, food addiction and eating disorders (such as anorexia nervosa and bulimia) are distinct conditions, with a number of symptoms that differ from each other. Eating excessively large amounts of food in a specific amount of time. Eating whether or not you’re hungry. Eating very quickly while bingeing (a person often reports not really tasting their food). Eating to the point of physical discomfort or pain. Bingeing episodes typically done in secret (due to embarrassment or shame). Experiencing distress, depression, or anxiety about bingeing behaviors. Going through periods of trying to diet, while not losing weight. This is where it becomes trickier to discern one from the other, binge eating disorder from food addiction, because on the surface they look a lot alike. So while the observable behaviors may be strikingly similar between binge eating disorder and food addiction, the root causes are quite different. How Does a Food Addiction Develop? Other studies have looked at the role of post-traumatic stress disorder (PTSD) symptoms and food addiction and found higher rates of food addiction among those with PTSD.10 Trauma can clearly play a big role in eating-related addictions and should be considered when looking for the right kind of treatment. Family plays a large role in your relationships with food as well. Because of the primary biochemical component to food addiction, it is likely your parents passed it along to you genetically. Also, if your parent overeats or has an unhealthy relationship with food, you may be more likely to have an unhealthy relationship with food. Moreover, if your parents use food as a reward or punishment, or if they place an unhealthy emphasis on body image, corresponding unhealthy relationships with food may develop in you. The food choices parents or caregivers make clearly have lasting impacts on the food choices their children make throughout their lives. 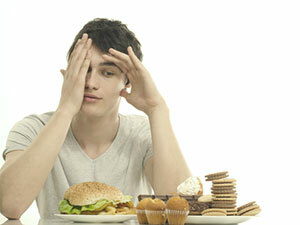 Environmental influences, such as peers, can play a triggering role in your development of a food addiction. Constantly being around others who have unhealthy relationships with food may lead you to develop similar associations. This can happen among friends, co-workers, or any other social group. Help is available for people suffering from food addictions. Treating food addiction must address both the physiological and psychological components to be completely effective.8 It is important to work with a medical doctor to test for the foods you are most biochemically addicted to and methodically cut those foods out of your life. Your healthcare provider may then refer you to a nutritionist, psychiatrist, or other specialist to treat your other symptoms. There are also many inpatient and outpatient eating disorder treatment centers throughout the country that may be able to treat food addictions. Behavioral therapies are commonly used in all of these settings to treat addictions, depression, anxiety, and other mental health issues. While there are many types of behavioral therapies, the following is a list of approaches that are effective for food addiction treatment. In Motivational Enhancement Therapy (MET), the therapist works closely with you to tackle the underlying causes of your addiction and help create internal motivation to develop new, healthy behaviors. This model includes an initial assessment and a few individual treatment sessions where you learn new coping strategies. You will also learn how to avoid high-risk situations and how to identify and change bad behaviors. Typically, this approach is quick—often just a few weeks, depending on your needs. So this approach will be best suited for those with relatively less severe or long-standing addictions who are already willing to change. The Cognitive Behavioral Therapy (CBT) approach focuses on the maladaptive thoughts and behaviors that can impact your emotions and actions and lead to addiction or other negative behaviors. The goal is to change your thinking process and learn new positive behaviors and coping strategies. The therapist works one-on-one with you for as long as your needs dictate, which can also be adjusted throughout the process. Peer support groups such as Food Addicts Anonymous can provide a safe place to share and learn from other individuals who are experiencing similar situations. This is especially recommended if you have already gone through the treatment process and are working on long-term recovery and preventing relapse. Nutritional therapies are highly effective for anyone who is suffering with unhealthy eating habits. You may have nutritional deficiencies as a result of your food addiction that require an individualized nutrition plan geared toward managing cravings. Nutritional counselors help you develop realistic plans that meet your lifestyle and goals; checkups are often required to determine your progress toward your goals. Most nutritional counselors will work with your doctor to ensure that any other underlying health issues, such as diabetes, are also addressed in the nutrition plan. In addition to talk therapy and other forms of counseling, medication may help address certain underlying causes of food addiction, such as depression or anxiety. This should only be done under the direction of your healthcare provider, who will likely recommend behavioral therapy in addition to medication. Your healthcare provider will likely focus on the underlying causes of your food addiction—such as trauma, depression, or relationship issues—and any other unique issues you may experience. This is why multiple treatment modalities may be necessary, such as therapy, nutrition counseling, support groups, or MAT. Without addressing the root cause, your chances of relapse are much greater. Unlike drug addiction treatment, abstinence is not possible or even healthy with food addiction. Everyone must eat to survive. Therefore, if you have a food addiction, you need to learn new healthy eating habits to replace the old ones. Nutritional counselors and healthcare providers can help walk you through these important life changes. They will help you develop a plan that will work for you and your lifestyle. Making changes is never easy, so follow up with your providers and create a support system that can help keep you accountable. Keeping a list of your goals in a visible place is also a handy technique to help keep you on track and motivated. The field of food addiction treatment is evolving, as is the science of understanding the causes, symptoms, and appropriate therapeutic interventions. But help is available for people suffering from food addictions. If you believe a food addiction is controlling your life, speak to your healthcare provider to find the best treatment plan for you and your lifestyle. Meule, A. & Gearhardt, A. N. (2014). Food Addiction in the Light of DSM-5. Nutrients, 6(9), 3653–3671. Pursey, K. M., Stanwell, P., Gearhardt, A. N., Collins, C. E. & Burrows, T. L. (2014). The Prevalence of Food Addiction as Assessed by the Yale Food Addiction Scale: A Systematic Review. Nutrients, 6(10), 4552–4590. Rosa, M. A. C., Collombat, J., Denis, C. M., Alexandre, J. M., Serre, F., Auriacombe, M. & Fatseas, M. (2015). Overlap between food addiction and DSM-5 eating disorders in a treatment seeking sample. Drug & Alcohol Dependence, 156, e192. Dimitrijević, I., Popović, N., Sabljak, V., Škodrić-Trifunović, V. & Dimitrijević, N. (2015). Food addiction-diagnosis and treatment. Psychiatria Danubina, 27(1), 101–106. U.S. Library of Medicine. (2016). Anorexia. U.S. Library of Medicine. (2016). Bulimia. National Institute of Mental Health. (2016). Eating Disorders. ACORN Food Dependency Recovery Services. (2016). Binge Eating Disorders & Food Addiction. Mason, S.M., Flint, A.J., Field, A.E., Austin, S.B., Rich-Edwards, J.W. (2013) Abuse victimization in childhood or adolescence and risk of food addiction in adult women. Obesity, 21(12), 775–781. Mason S.M., Flint A.J., Roberts A.L., Agnew-Blais J., Koenen K.C. & Rich-Edwards J.W. (2014). Posttraumatic Stress Disorder Symptoms and Food Addiction in Women by Timing and Type of Trauma Exposure. JAMA Psychiatry. 71(11), 1271–1278. Murphy, C. M., Stojek, M. K. & MacKillop, J. (2014). Interrelationships among impulsive personality traits, food addiction, and Body Mass Index. Appetite, (73), 45–50.